We’ve followed Spider-Man’s reclamation back into the true Marvel-verse pretty closely, starting with the initial reports that Spider-Man would indeed be an Avenger. As a matter of fact, we’ve been in the “Spidey back to Marvel” camp since we learned Andrew Garfield would suit up in the Amazing Spiderman reboot. We’ve also reported reported frontrunners to land the legendary role, and today it seems as if Marvel finally has their man. 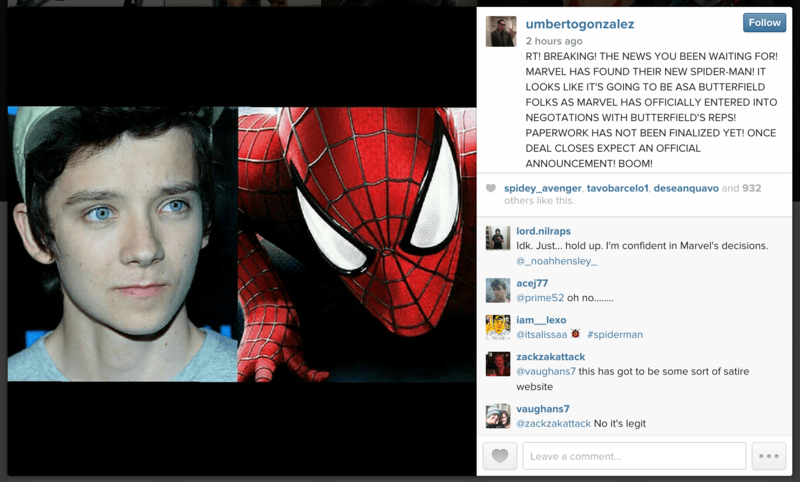 Latino Review, which was one of the first to break the “Spidey comes home”, and is fairly credible, is backing a report that Asa Butterfield has finally been cast as Spider-Man. Butterfield is best known for his performance in Ender’s Game. According to their accounts, this has been a done deal since Friday, and have since today backed reports from one Umberto Gonzalez. Latino Review takes it a step further by also reporting that Spidey will make his first appearance in Captain America: Civil War. Marvel has made no official announcements at this time, yet Asa Butterfield has long been rumored to be the frontrunner. So, what do you think? Is Asa Butterfield the best choice to play Spider-Man? Let us know in the comments below! Have you heard the latest episode of the JustUs Geeks podcast? It’s all about summer blockbusters! Click here to listen! Scott Grimes liked this on Facebook. McKenzie King liked this on Facebook.